Struggling with dry skin? Or is it really dehydrated skin disguised under dry skin conditions? There’s a BIG difference between the two, and it all has to do with the water and oil content in your skin. Both can appear to be exactly the same at first glance: Itchy, flaky, or ashy skin that feels tight, maybe even a little sensitive with some redness. However, treatment can vary greatly depending on whether you truly have a dry skin type, or if you have dehydrated skin conditions. So, let’s break it down. Everyone is born with a natural skin type that is either more dry or oily on the spectrum. If you are a dry skin type, it means that your skin is lacking OILS, or sebum. Your pores likely appear near non-existent (imagine!) and you probably don’t suffer from acne breakouts very often (a dream! ), but your skin often feels rough or bumpy and is more prone to premature signs of aging than someone with an oily skin type. Dry skin is also greedy skin. Moments after applying a moisturizer or lotion, dry skin types hungrily soak it up, leaving you struggling to remember if you actually applied anything at all. To save your dry skin (and sanity), balance your pH levels by treating your skin with hydrating toners to soften constricted pores, which will then allow oil-rich products to penetrate deeper into your skin, yielding more effective, visible results. Regardless of your skin type, anyone can experience dehydrated skin. 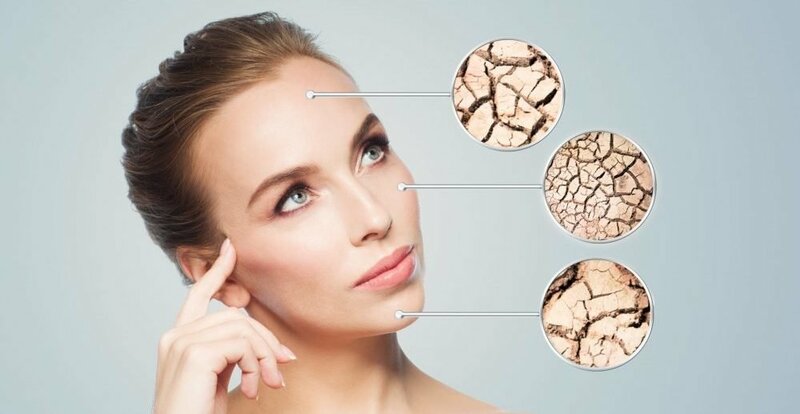 This is usually caused by environmental factors that can be temporary, seasonal, or a long-term condition, and it means that your skin is lacking WATER. The skin can look and feel simultaneously dry and oily which can be frustrating and confusing. How are you supposed to dry out an oily breakout when right next to it lies a flakey, dry patch of skin in desperate need of extra moisturizer? The answer lies in two parts. First, you will want to identify the source of dehydration. Is your environment extra dry due to weather? Are you using a product that is drying you out? Have you been indulging in too many sodium-packed snacks that are just as dangerous as they are delicious? Second, depending on the source, you will want to introduce more water into your routine in a way that makes the most sense. Try products containing hyaluronic acid which can hold up to 1,000 times its weight in water! Always, always make sure to wear a daily SPF to protect skin from harsh weather conditions. And go ahead and order your Chipotle with extra guacamole. Aside from being totally worth the extra dollar, avocados are rich in Vitamin E and monounsaturated fats, which will help keep your skin happy and hydrated!